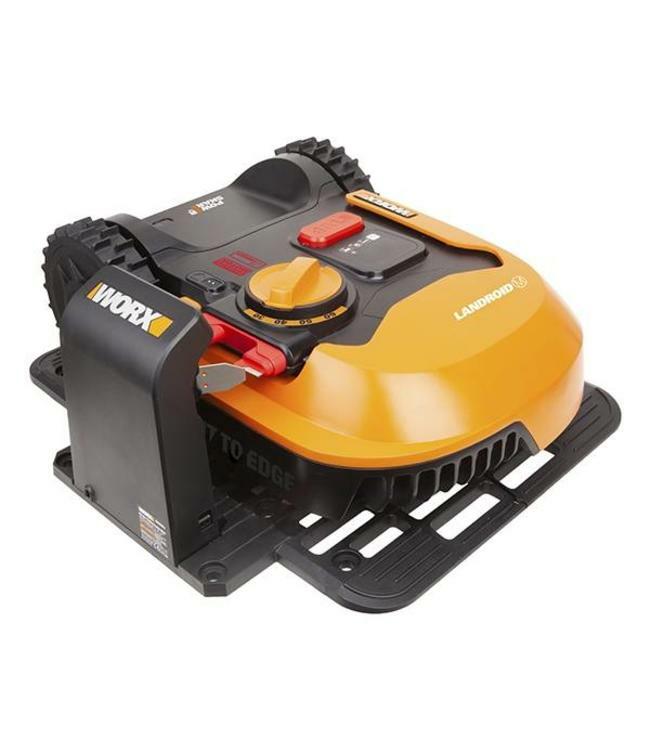 The Worx Landroid WR142E is suitable for lawns up to 700 m2. Using a strong lithium-ion battery, it manages slopes of up to ±35 % (20°). Handy: The 20 V battery is also compatible with other Worx devices and tools! The lawn mower robot can be easily controlled and programmed via app. By walking over the lawn with the smartphone, the size of the area is automatically determined. The Worx WR142E then independently creates a customized, ideal mowing plan. However, the robot mower not only considers the lawn size, but also adapts its mowing behaviour to the weather conditions and grass growth. Your lawn will receive optimal care through the Worx Landroid M700. The Worx M700 robot lawn mower is equipped with AIA technology. With this artificial intelligence, it mows narrow passages reliably and skilfully navigates through them. This makes the Worx Landroid M700 particularly suitable for complex lawns. The lawn robot also offers multi-zone programming for an optimum maintenance of ancillary surfaces. Via the Wi-Fi connection, the Worx WR142E automatically updates its firmware. Thus, your robot mower is always up to date. The robot mower navigates at random. It trims the grass with three sharp blades mounted on a rotating knife disc. By rotating in a clockwise and a counter clockwise direction, the blades will be evenly worn on both sides. This reduces the blade exchange to half. The cutting heightcan be adjusted in four steps between 30 and 60 mm, depending on requirements. The finely chopped grass remains fall down to the ground. There, the so-called mulch serves the lawn as a moisturizer and nutrient supplier. With a rain sensor, the Worx robot lawn mower recognizes when it rains. Then it interrupts its mowing operation and continues as soon as it is dry again The sensitivity of the sensor can be adjusted as needed. Thanks to a weatherproof construction, the lawn mower robot can also be used in wet conditions. When the battery level is low, the lawn robot automatically returns to its charging station to recharge. Side-mounted charging contacts allow the robotic lawn mower Worx M700 to easily pass through the charging station. This allows a very flexible placement of the station in the garden. On command, the lawn mower robot mows along the boundary wire (cut-to-edge function). Thus, the lawn edges are well-trimmed and less rework is necessary. For advanced operation, the Worx Landroid M700 robot lawn mower can be upgraded with various accessory parts. This will allow you to equip the device to best suit your needs. With ultrasonic sensors, the Landroid detects obstacles. Thus, it does not bump into them and drives skilfully around objects. The Worx Landroid M700 can also be controlled by voice commands through built-in speakers. In the event of theft, the position of the lawn mower robot can be determined using 4G technology. Note: Other accessories are supposed to follow, according to the manufacturer. When lifting or tilting the robot mower, the sharp blades stop immediately. A PIN code serves as a child safety lock and protects against unauthorized use. In addition, the Worx M700 blocks as soon as it is located outside of the network. The Worx Landroid WR142E is delivered pre-programmed and can be installed in just a few steps. All major accessories for installing the robotic lawn mower Worx Landroid M700 (boundary wire, etc.) are included in the scope of the product. At the touch of a button, the robot lawn mower is ready for the first mowing operation. Plug’n’Play!